Sanjay Sahu, 46, stays with his homemaker wife, 39, and two children, aged 12 and four, in his own house in Mumbai. He earns Rs 91,667 a month, and combined with a rental income of Rs 15,000, his total income comes to Rs 1.06 lakh. Sahu has invested aggressively in property (Rs 1.9 crore), equity (Rs 19.9 lakh) and debt (Rs 59.5 lakh), resulting in a portfolio worth Rs 2.54 crore. This, after discounting a home loan of Rs 24.5 lakh, for which he is paying an EMI of Rs 38,770. His goals include building an emergency corpus, saving for his children’s education and weddings, buying a house and creating a retirement corpus. He can achieve these goals with the help of his existing resources. Financial Planner Pankaaj Maalde suggests he build the emergency corpus of Rs 5.5 lakh, which is equal to six months’ expenses, by allocating his cash. He can invest this in a short-duration debt fund and increase the corpus at the earliest. For the higher education expenses of his first child in six years and second child in 14 years , he has estimated a need of Rs 45 lakh and Rs 75 lakh, respectively. 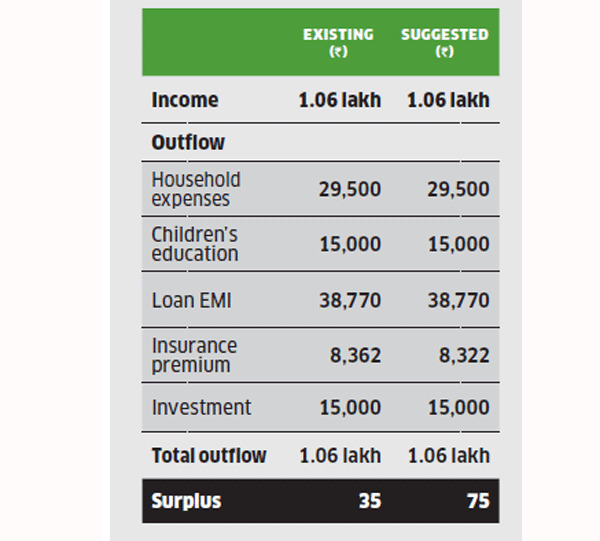 For the first goal, he can allocate his fixed deposit of Rs 25 lakh, while for the second one, he can assign his stocks and insurance maturity value. He doesn’t need to make any fresh investments for these goals. As for the kids’ weddings in 13 and 21 years, Sahu will need Rs 72 lakh and Rs 1.2 crore, respectively. 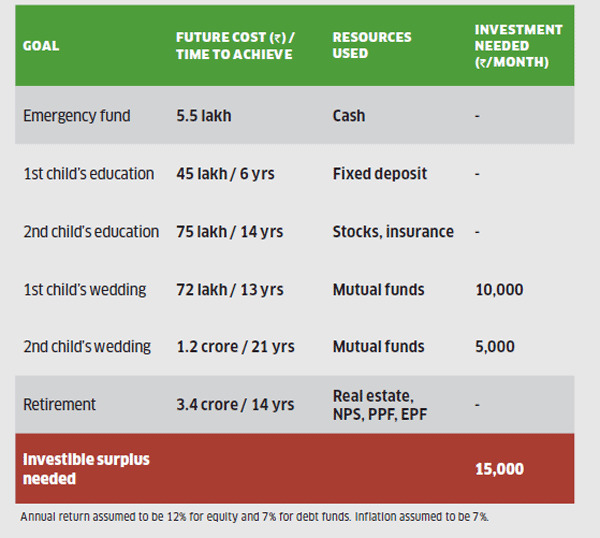 He can split and allocate his mutual fund corpus equally for the two goals and also start SIPs of Rs 10,000 and Rs 5,000, respectively, in diversified equity funds. As for retirement, for which he will need Rs 3.4 crore in 14 years, he can assign his property, NPS, EPF and PPF corpuses. These will yield the desired corpus in the specified time frame. Sahu also wants to buy a house worth Rs 50 lakh in six years, but Maalde suggests he avoid this due to the heavy real estate skew in his portfolio. 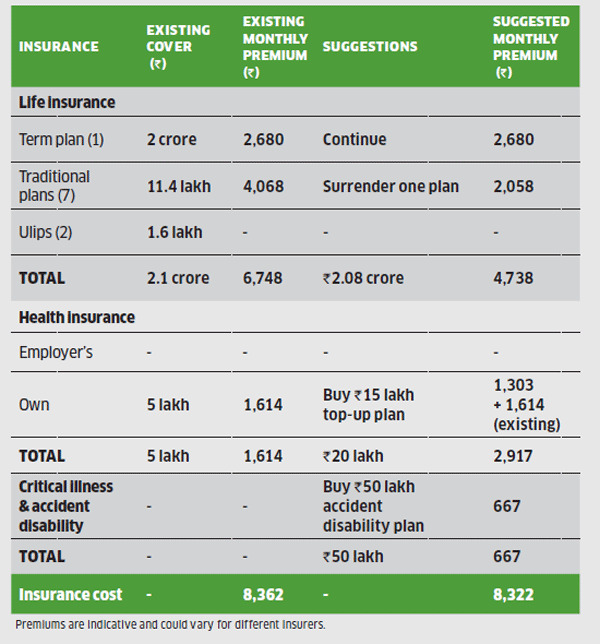 For life insurance, Sahu has a Rs 2 crore term plan, seven traditional plans and two Ulips. He should continue the term plan, and surrender one traditional plan, while retaining all the other policies. As for health insurance, he has a Rs 5 lakh family floater plan and Maalde advises him to retain it. He should also purchase a Rs 15 lakh top-up plan with a Rs 5 lakh deductible, for Rs 1,303 a month. Besides, he should buy a Rs 50 lakh accident disability plan, for Rs 667 a month.